Critiqued as a gay activist masquerading as a journalist, Rink Foto has photographed San Francisco’s LGBT community since 1969. His photographs have been published in more than 40 books and in three Academy Award winning films. Below is a photo of the Harvey Milk Gay Democratic Club contingent in the 1982 Lesbian & Gay Freedom Day Parade. The Milk Club is named in memory of Supervisor Harvey Milk, the first openly gay US politician, who was assassinated along with San Francisco Mayor George Moscone, in November 1979. 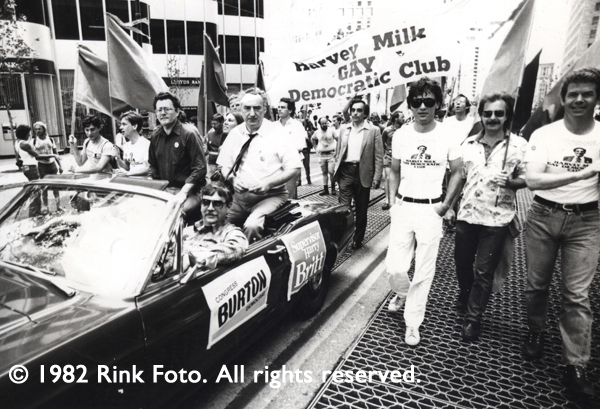 Harvey Milk Gay Democratic Club contingent, 1982 Lesbian and Gay Freedom Day Parade, Rink Foto, photograph, 1982. L. to r. holding flags, Bryan R. Monte and Paul Melbostad; in car, San Francisco City and County Supervisor Harry Britt, US Congressman Phil Burton and driver, Bob Ross; under banner in jacket, John Bardis; far right, Ron Huberman.